She would find today’s online book reviews perfect for our modern world. She loved a good book. She loved talking about the author and what may have driven them to the hard work it takes to produce a book. My writing compulsion came from wanting to tell my dad and her story – of their falling in love in China and marrying there on a crisp, autumn day in Peking (Beijing). My parents’ love affair lasted sixty years. They died within two days of each other. Hard on their children. Great for them. Today, on my Mom’s honored day, just in case for some reason her internet connection isn’t working in heaven, I’ve decided to share with my mom a few of the reviews I’ve received on Amazon thus far. It’s been six weeks since my book debut. 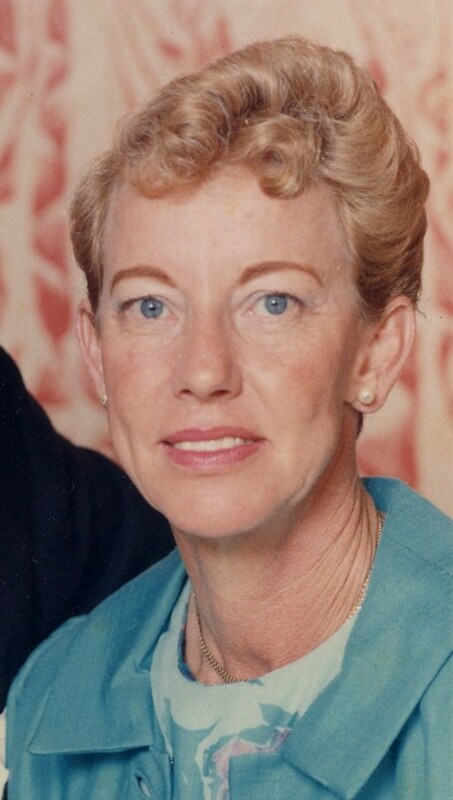 It may appear that I’m being selfish on this day that really belongs to her…but the truth is, like every Mom, she was very proud of me. She would be glowing when she read them! I love you Mom. My family has lived in the U.S. for several generations. Except for inheriting a faded, sad 1939 letter from a cousin in Prague pleading for a sponsor to bring his wife and two young children to America, I had no other known relatives living in Europe in the 20th century. 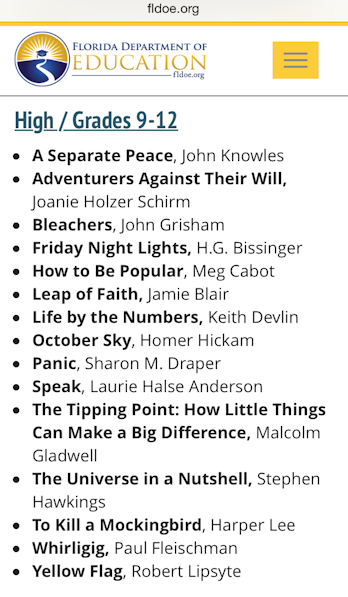 In 2011, the Internet at last yielded up my relative’s name in a short article written by Joanie Schirm. I contacted her immediately, and finally learned what happened to my cousin and his family during the horror of WWII. Joanie asked for permission to use my name in a book she was writing. “Adventurers” was the surprising result. 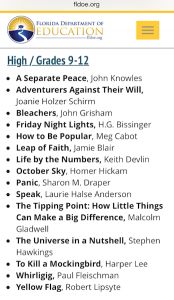 Even though I am mentioned in Joanie’s book, and my cousin’s journey–one of several–is so movingly told, I can (nearly) objectively state that Joanie’s writing style is stellar, the historical context woven throughout is fascinating, and the emotional wallop the stories pack is undeniable. A truly compelling read from a talented writer. We are indebted to Joanie Schirm, the daughter of Valdik Holzer (the focal `adventurer’), for sharing the wonderfully rich letters of her father and his friends with us. The book is more than a story of a group of friends, of their trials and survivals (or deaths): Joanie has created a micro-history of a time when Czech Jews and Gentiles were caught up in the expansion of the Third Reich, first into Sudetenland in October 1938 (with the agreement of France and Britain), then followed by the invasion and occupation of Bohemia and Moravia in March 1939. The Nuremberg laws limiting what Jews could do, or own, were applied progressively in the `Protectorate’. How hard it must have been for those at threat (my parents included) to understand the murderous intent, and the ruthless efficiency with which it would be implemented. Who could have thought, who even now can comprehend, that organized theft would be followed by confinement, slave labour, and the gas chambers? Joanie’s work, and it was work, involving unravelling the many threads that wound through more than four hundred letters of her father and the other `adventurers’, has resulted in a gripping tale of intertwined lives. The reader is helped through this complex of life stories by Dramatis Personae at the beginning of each chapter, and by Biographies and Timelines at the end of the book. We are moved and touched by the opportunities of escape seized or missed, and by the many photos of the protagonists and their families. A wonderful book. Thank you Joanie! 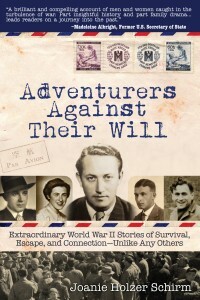 Adventurers Against Their Will alternates between letters and providing context for the letters of the Author’s Czech father and relatives during World War II. Europe, China, South America, America are all visited. Great work. This is well researched and beautifully written book that provides a clear picture of how ordinary people reacted to the changes in their lives brought on by WWII. Joanie Schirm brillantly weaves the story of her father, his family and his friends between excerpts of letters between them. These letters highlight their feelings not only about their personal situations and relationships, but also about the broader political events around them. I had trouble putting it down. Adventurers Against Their Will is an amazing story about survival, loss, hope and the importance of carrying on the message of generations as they pass. It made me want to run to my parents and grandparents and capture their own life stories before it’s too late. 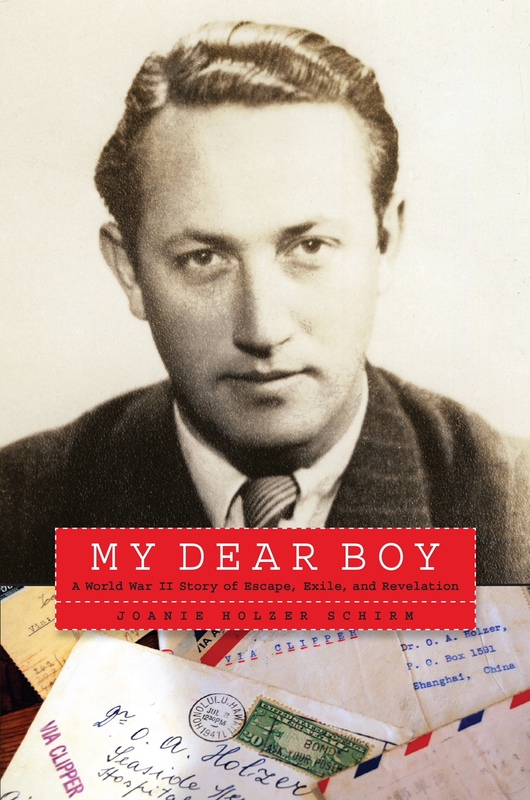 Schirm does a beautiful job portraying the seven letter writers in this book, as they individually travel through the uncertainties of life as a Jew in Europe during WW2. Not only does the reader finish the book feeling as though they’ve learned more about that period in time, but he/she also catches a very real glimpse into the lives of men and women — just like you and me– who lived through that tumultuous time with such grace and dignity.